I remember vividly when my son MacKale entered third grade, walking into his classroom which, of course is in my same elementary building and saying to his teacher who I’ve known nearly my whole life, “Deb, MacKale is a smart kid, but he WILL fall off his chair.” He was and still is a very smart kid. It just so happened that was constantly in motion and it usually manifested itself as him falling out of a chair, sitting upside down to read or having his feet in some way, shape or form in constant motion. As a teacher, I knew it didn’t impair his learning. I also knew he wasn’t the only kid like this. I also realized, however, that, in general, many classrooms where not equipped to ‘handle’ kids who worked best while in a constant state of motion. Traditional classrooms have chairs with desks and a name neatly labeled on top, indicating an assigned seat. Neat and tidy rows separate one desk from a neighbors and materials are stored within the depths of that desk so they are always close at hand. No need to get out of your seat for any reason other than perhaps a trip to the restroom. It’s all very neat and tidy . . .
Luckily for me, my very active boys have always had amazing teachers that just ‘get them.’ Like so many other teachers around the country, these educators have developed strategies to try give those kids ‘brain breaks,’ chances to collaborate with other kids and opportunities to move within and despite the limitations of their classroom and its’ furnishings. It’s definitely helped! But is it enough? Could we do better? Could I do better? Look at trends in the corporate workplace environments. Today our best and brightest companies have elected, instead of hog-tying their employees in traditional office spaces that stifle creativity and collaboration, to embrace a flexible workplace environment where workers have the choice to embrace collaboration in an open workplace environment while offering places for independent or small group break out rooms. They have discovered the benefits that natural lighting offers, flexible seating, work stations and mobility which all support their employees in the various ways that they work best and are most productive. All this and yet, we are constantly pushing for greater ingenuity, creativity and productivity from our own children in our schools, and our classrooms continue to stifle them with desks and chairs which, in my opinion only, are more suited to the first half of last century. This goal has not been an overnight project for me by any means. It’s one that has taken a ton of time, energy, contemplation and hard work. I had to work within HUGE limitations of space, time and money. But little by little, I have been chipping away at it, and I finally feel like I can share some of my progress with all of you. The first thing I did to encourage more movement was to get rid of a ton of a bunch of big, bulky, tall furniture. 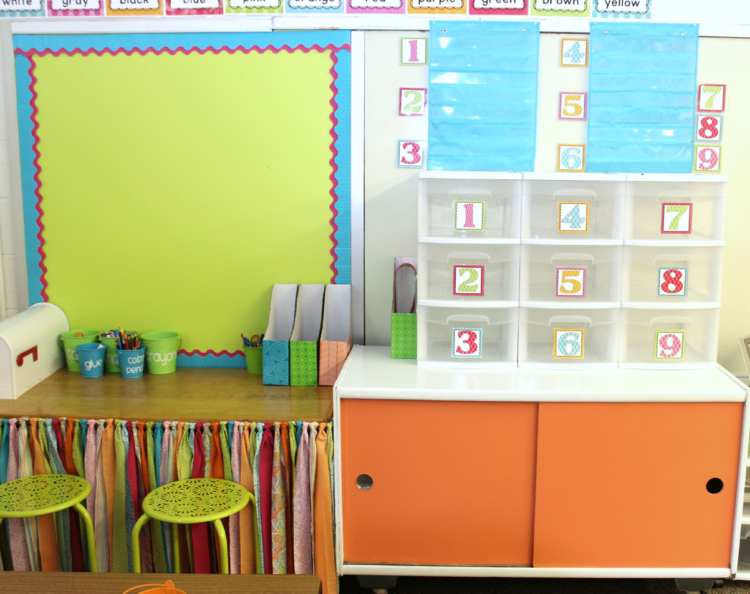 If I wanted my students to have more space, I needed to get rid of bulky items and also give myself a clear view of the room. I paired them with whatever bins I had available at the time because, honestly, new bins were NOT in the budget. Most of these book bins I had secured in the couple of years before from either Big Lots or Really Good Stuff. I felt like, as long as they were easily accessible and in working condition, I needed to keep them. The other thing I did was give my room a clear path of movement. I eliminated as many ‘dead ends’ as I possibly could. It was my goal to eliminate ‘bottle necks’ in transitioning. No matter where a child decided to work, I wanted there to be a couple of different exits. Traffic jams needed to be a non-issue. Part of accomplishing this meant that years ago I gave up a teacher desk and my poor basement storage room in my home has because my ‘classroom’ storage room instead. It’s a price I had to pay to clear out everything that I didn’t need right then and make the space I wanted for my students. 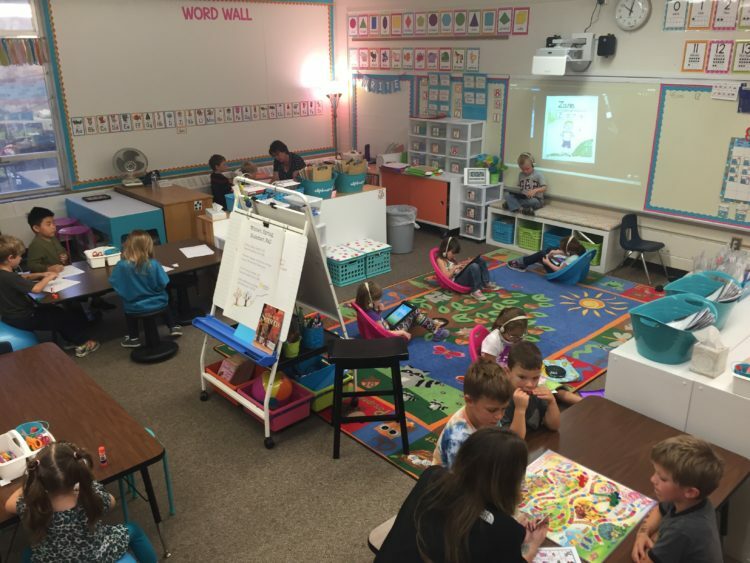 Center/station work allows for more focused practice and cooperative learning with peers. 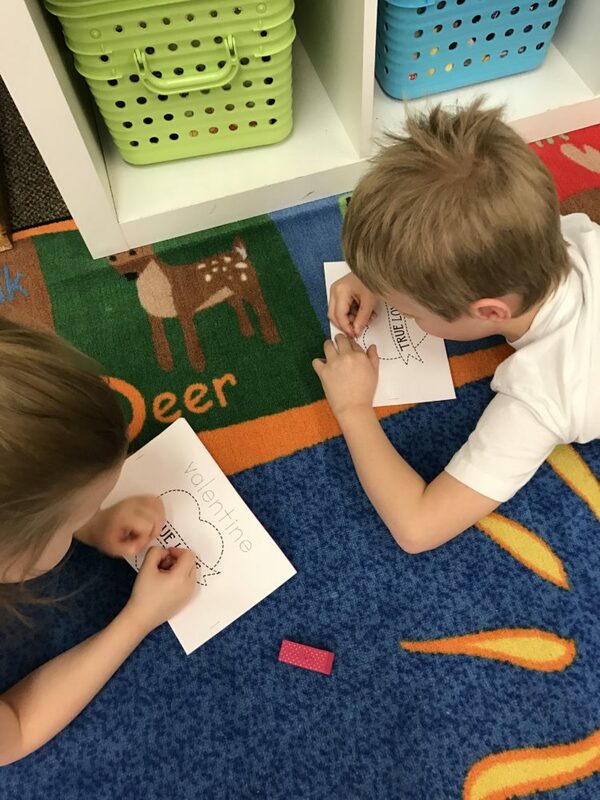 Working within small groups is so so so important in kindergarten! Because I use a drawer system for station work, students can easily grab a station and go to wherever they would like to work. They can choose the floor, a bench, or table. The choice is theirs. If at all possible, I make center work easily and independently accessible to them. Even my listening center is grab and go. Everything they need in a bag! For stations, they pull out the drawers or materials, and they return the materials when they are done. This is a BIG goal. 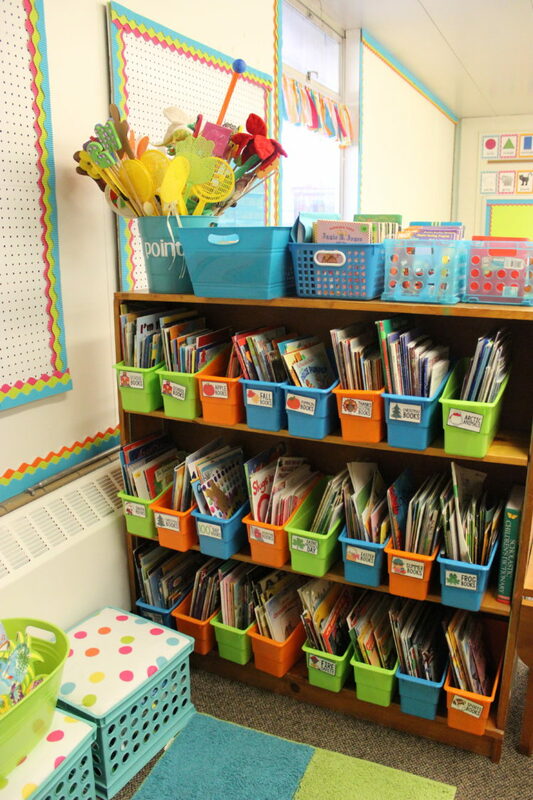 I still have one set of stations, my math stations, which are a bit ‘out of reach’ for some of my smaller students. 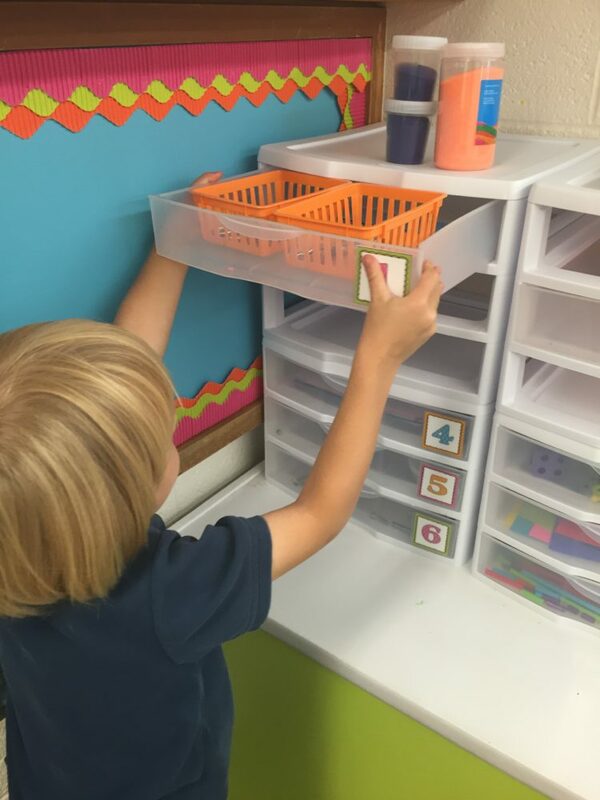 They somehow make do and help each other with materials, but I’m hoping to find a storage solution this summer that will allow me to get those drawers lower for those students who can’t quite reach them. I love the way my classroom feels and sounds during center/station times . . . Daily 5 . . . Morning Fine Motor Work Stations . . . Math Stations . . . all those different times of the day there energy and engagement. Students are collaborating, practicing skills and learning! I don’t fuss about how they sit, where they sit or if they don’t sit at all . . . they are engaged and learning. 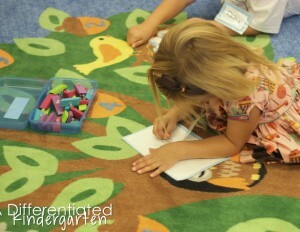 Let’s be completely honest, kindergarten is not always whole group friendly. I think it can be one of the most difficult parts of teaching. You really really really have to have an interactive, engaging gig to make it work for even short periods of time . . . especially at the beginning of the year. Whew! 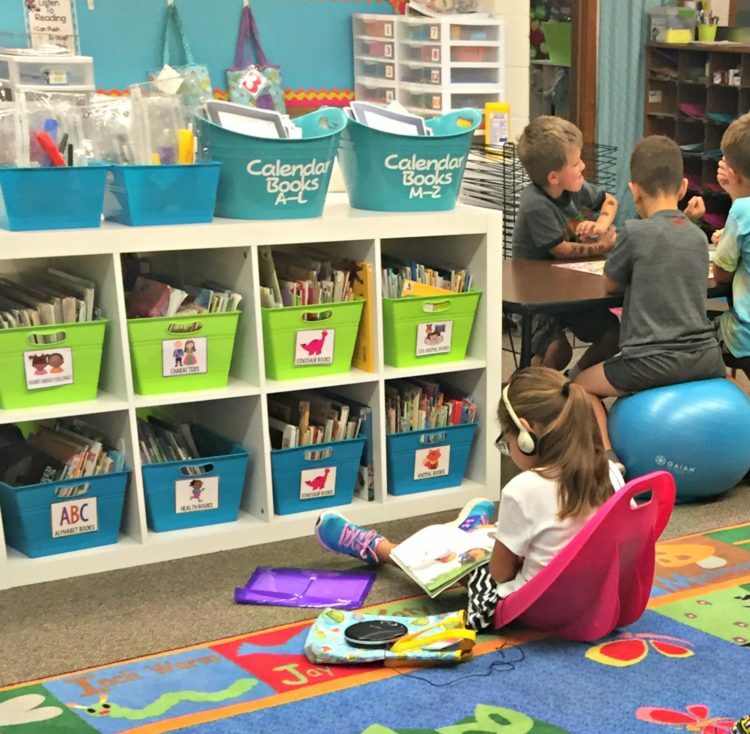 Prolonged sitting in one place, in my experience, just isn’t the best way to keep kinder-kids engaged in learning. Whole group is great for read alouds, class discussions, sharing and speaking-listening type activities–not for lecture. Which leads to the next item . . . of course, you are going to have a whole group time so you need a whole group area. If at all possible, don’t skimp on space. The more space you can give little bodies to not be on top of each other, the less behavior and attention issues you’ll have. 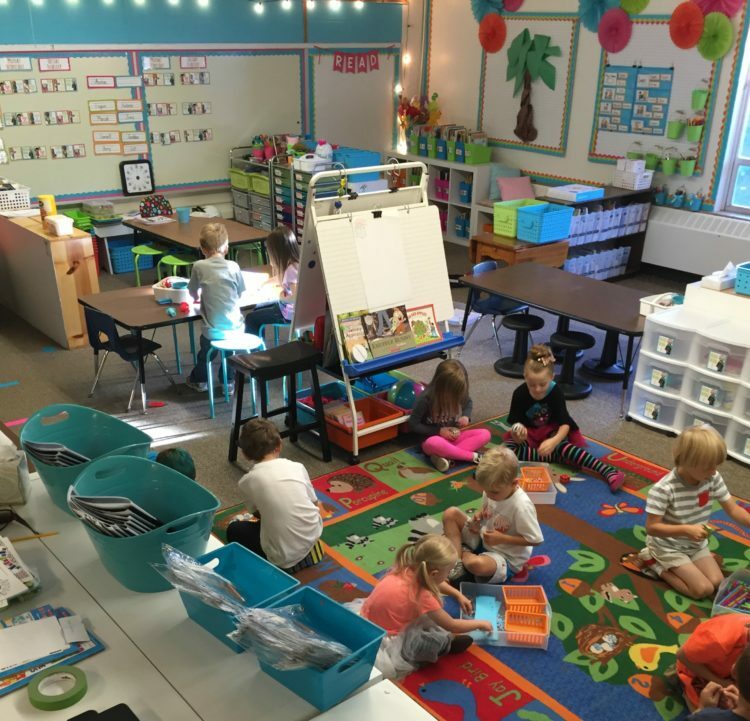 When students have enough space during whole group, it will give you greater opportunities to use call-backs, hand signals, sit-stands, share and pairs and other tactics to keep them on task, engaged and loving learning. Your whole group time will be infinitely more successful and less stressful. Plus . 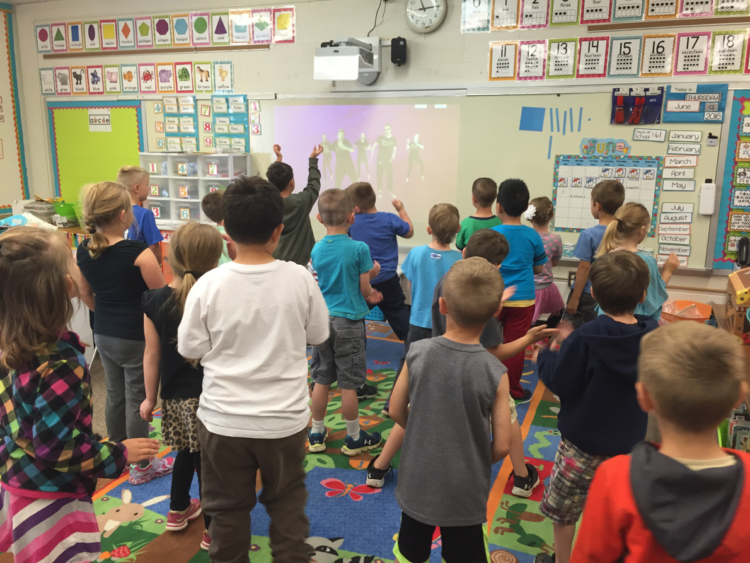 . . you’ll need some descent dance space for those GoNoodle Brain Breaks anyway (Am I right?). Making your word wall BIG and visible from anywhere in the room means your students can work anywhere. Here you see I have one HUGE wall dedicated to my signt words, word family words and classroom names. 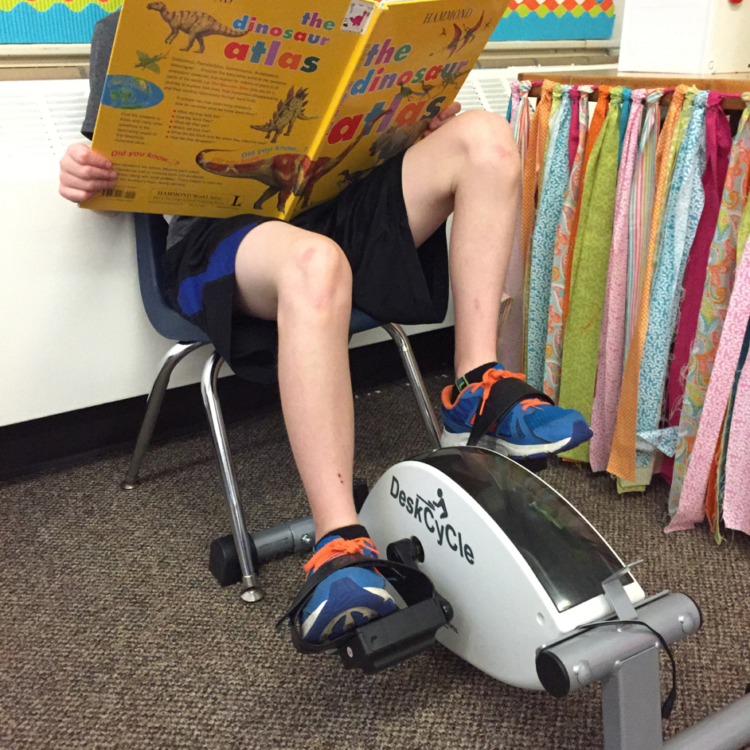 If your students are going to be moving around, sitting or laying on the floor, then tools need to be portable. 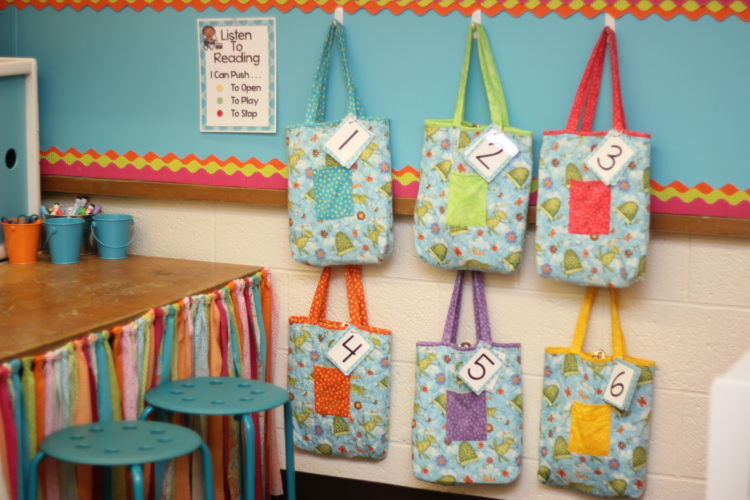 I have a classroom set of clipboards and a couple of bins that have pencil pouches in them. Students just grab a pouch and a clipboard (you can see . . . they have been well loved) and they can really work anywhere. Other materials they might need . . . scissors . . . hole punches . . . whatever . . . they are all community use and available. Just grab and go. The same goes for sight word and word family rings. Although I have a huge word wall, I wanted to make sure my students could grab words they needed and move to a place that was ideal for them. I didn’t want to have to have them sit by the word wall every time they needed a word. 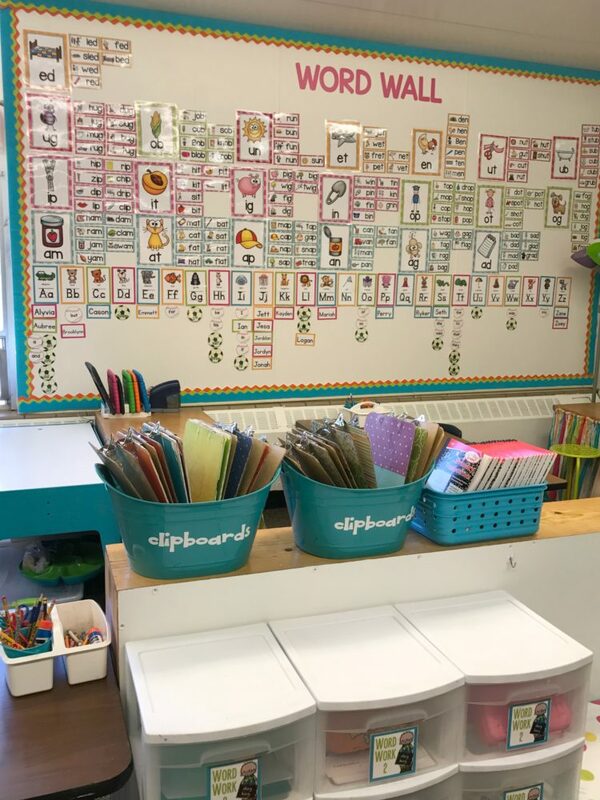 The week before my first day of the first year that I taught kindergarten, I came into my classroom and labeled my desks with all my students’ name. It was gorgeous let me tell you! And the second day of the my first year of kindergarten, I ripped them all off. 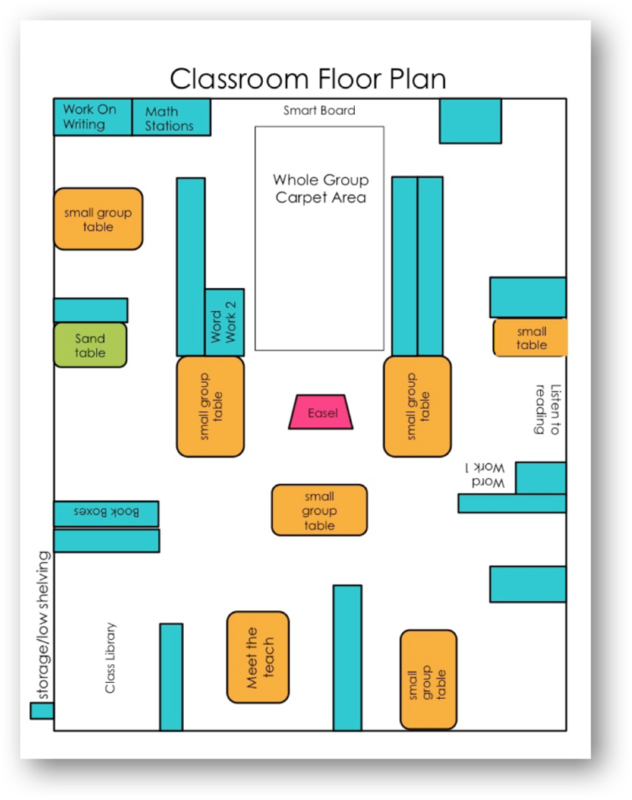 I just couldn’t get my head around how using flexible grouping and small groups could work when students were obsessed with where they’re name tag was located and who was sitting in ‘their spot’ at any given time. It might work for others, but it didn’t work for me. 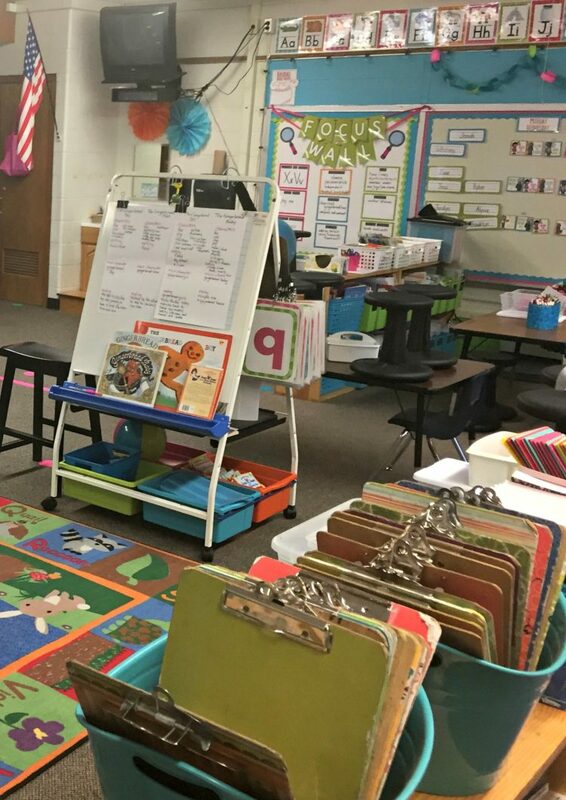 I needed my tables to be available to use for different station activities and I knew that students would never be in ‘their spot’ for any extended period of time. So, I don’t have assigned seats. During morning work, math stations, Daily 5 and even during whole group calendar math time, students are going to be working with a wide variety of students. I want them to have those different kinds of engagement throughout the day with different people. By keeping my spaces unassigned, I can accomplish that much easier. I often hear, “…but don’t they fight over who gets which seat?” Surprisingly, no they don’t. 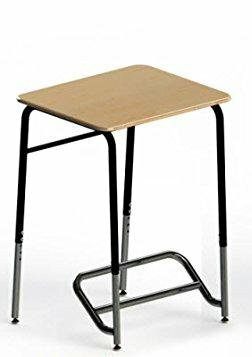 My students use these sitting or standing. 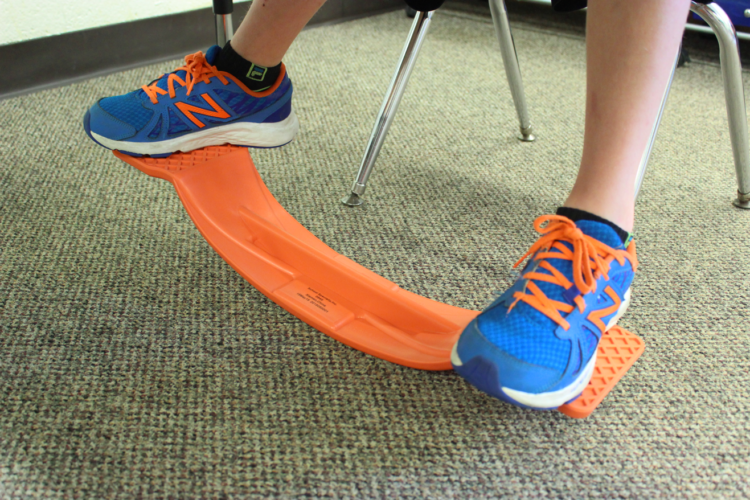 They work great while sitting to keep their feet moving instead of kicking everyone around them. You can learn more by clicking HERE. I think they figure out where they work best by the end of the first month of school and students tend to migrate to those seating choices. I have enough of each so that if they prefer the ball there are 4-5 of them in my class, and nearly 16 wobble chairs and 8 scoop chairs and 2 benches and a number of pillows. They also get that because we are moving so often, there are so many opportunities to change where you sit throughout the day and you aren’t in one place at any one time. Practice, model, practice. Of course you are going to model. You are going to show them the right way to choose locations to work, the correct way to use seating and trouble shoot any problems. You are also going to show them the wrong way. Of course you are going to set good rules and routines. You are going to give them the chance to practice. At the beginning of the year, I know it’s sometimes difficult for some students to understand ‘personal space.’ Or they struggled with understanding that perhaps sitting right in front of the bathroom door isn’t such a great location for working. So I also use SitSpots to give my students some guidance in choosing ‘good’ places if they want to be on the floor. SitSpots helps greatly in those early weeks. I find that some students just need them to make a good choice. And you know what? That’s ok. That’s why I’m here . . . to help them make good choices and feel successful. And you know what else? They are going to be doing great. Life is going to be going so well and you’ll be chugging a long like a well oiled machine and then one day . . . it will feel like you have a group of alien children in your class that can’t remember what the rules, routines or expectations are! And you know what else? That’s pretty normal. It totally happens to everyone. So what do you do? 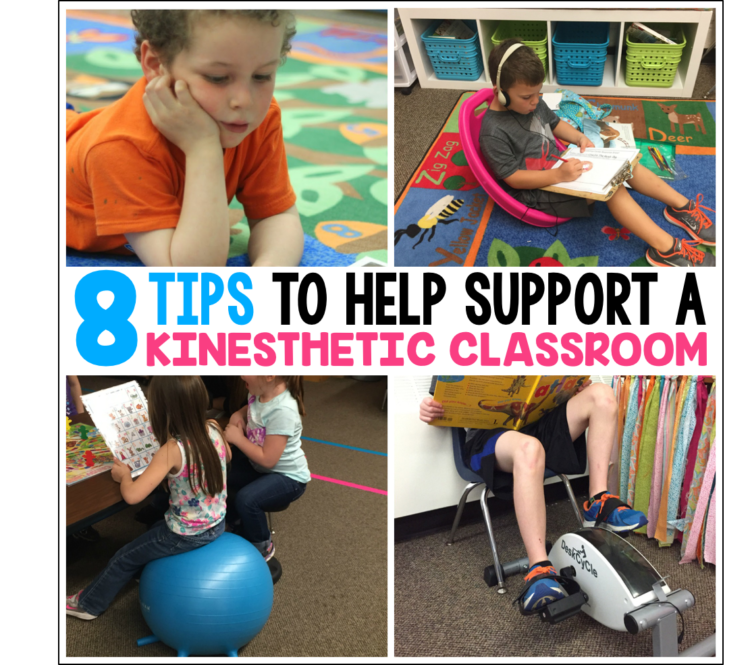 So I told you, this post took me well over a year to write just because I didn’t want to throw a bunch of stability balls in a classroom and say, “flexible seating is the way to go.” I kind of needed to make my scope bigger and make it more about movement than about seating. And I wanted to see how my class would change . . . or if it would even change. Here’s what I can tell you. For as many years as I have been teaching, I have had a clip-type behavior management system. 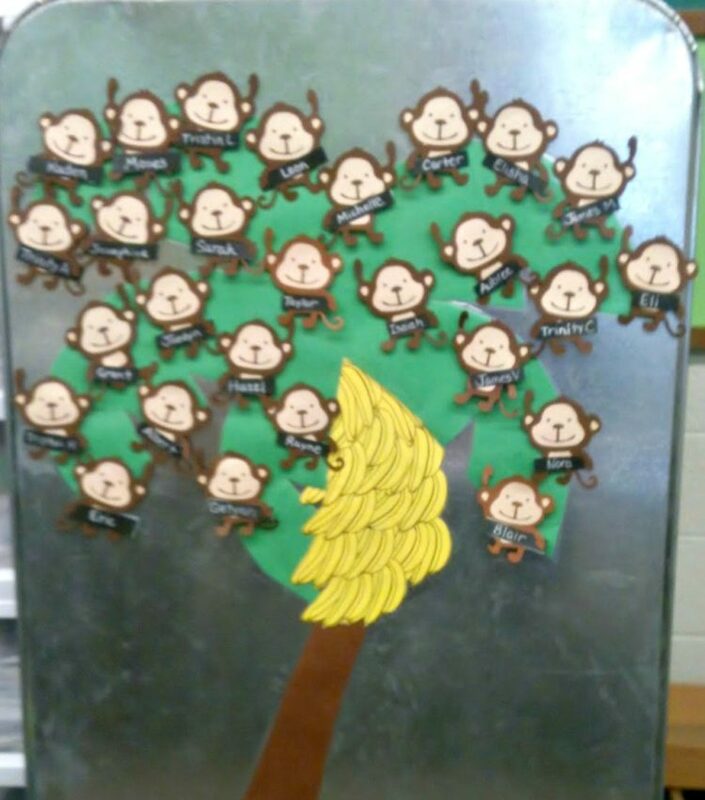 It was monkeys on a tree but still the same idea. But this year, I took it down. I never used it. It didn’t exist. Was this the result of having really good kids or kids having the opportunity to move? I don’t know, but I can tell you , I don’t miss that stupid monkey tree. Was everything perfectly perfect in every way? No. Of course not. I found that for the littlest students in my class, the ones that were physically just tiny . . . they can’t reach the floor with my stability balls and my shelves were still too tall to use as a work space. So even though I have the smallest ones I could find, I need to come up with a different ‘bouncy’ type solution for those tiny friends who would choice that kind of seating. Also, I want to do something about the lighting.. I know it has nothing to do with movement, but I found my own eyes hurting from the overhead lights in my class. I have some other lighting options, but not enough. 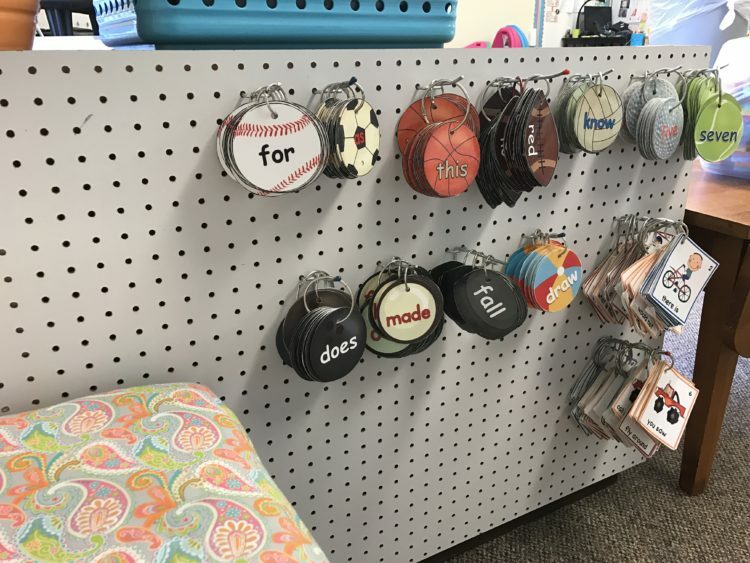 Are their other things that I still need to get for my class to address the working styles of my students? Yes. I think there are, but space is a HUGE factor. I feel like I’m kind of bursting at the seams right now and the area that has suffered the most is my tiny little dramatic play area. That, quite honestly, breaks my heart. But to bring it in means something else has to leave. I have to figure out what that is. Over-all though, I know that the little changes I have made each year are getting me to where I want to be with giving my students the greatest opportunities to be mobile, to wiggle, swivel and move when their bodies need to be moving. It’s still not perfect, and it never will be, but the great thing about teaching is that we, as teachers, are always searching for new ways to improve and do better by our students. It’s who we are. It’s why I’m proud to be a teacher. You have presented some ideas I have not seen before. 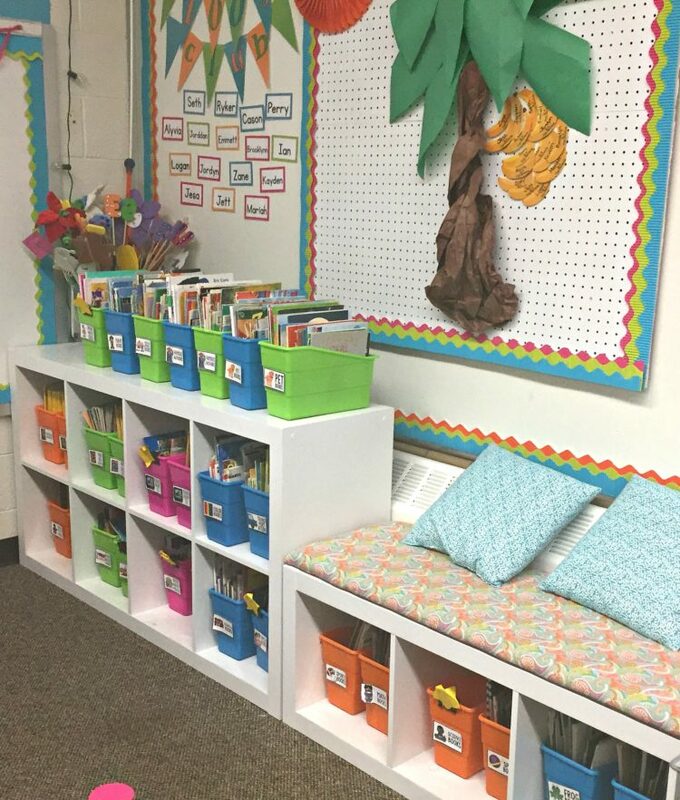 I would love to incorporate some of the seating or ‘foot motion’ items into my 2-8 art room. I now have ONE bouncy ball I came across at a rummage sale. I would love to find some of the other things. I do appreciate your mention of flexibility and differentiation. A large factory in our area decided to do away with ALL desks in the office areas. That caused a lot of unhappiness for those who were not comfortable without a ‘home base’ or with always standing or finding alternate places to be. That idea was soon modified, I believe! 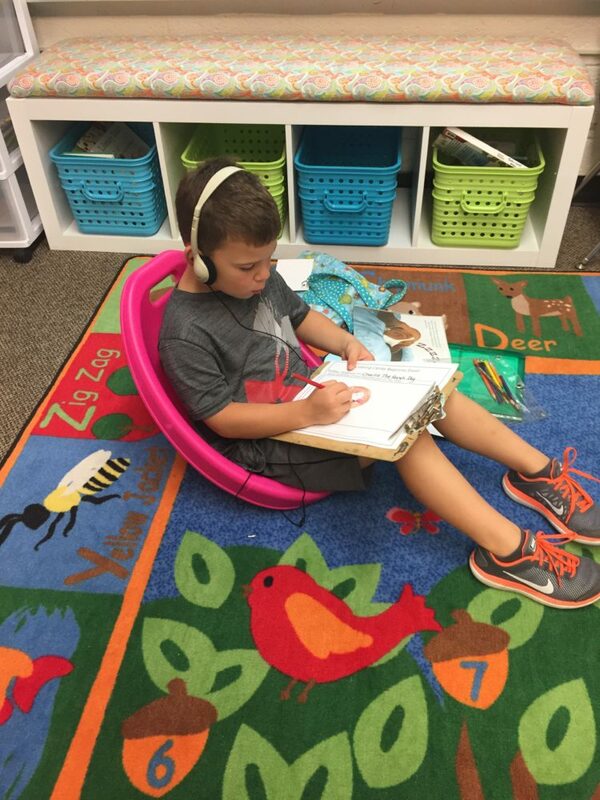 I have been thinking about flexible seating for a while now, but I am hesitant because we eat in the classroom. I do not like the idea of students eating on the floor. I love picnics, but not daily and our rooms are not always cleaned in a way the makes me feel like it’s sanitary. Second obstacle is that I have desk and not tables. Do you have any suggestion? 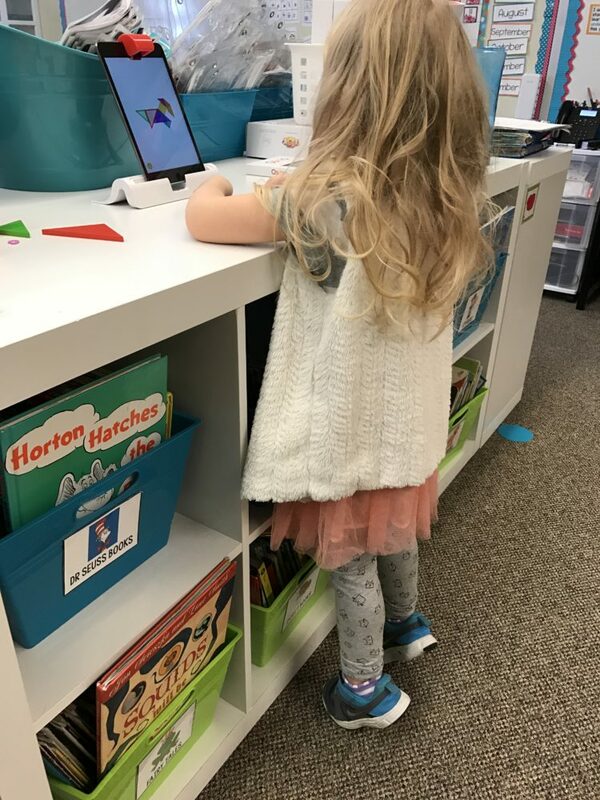 I couldn’t afford standing desks but I found that my back counter and the tops of my bookshelves are the perfect height for my K class. That meant I had to find new places to store my supply bins and such but I realized that some items I always have out don’t really need to be (magnifying glasses, chalkboards, etc.). Might be a short term option for you! Could you just use bed risers on a table you already have to make yours a standing table? Does every kid have a pencil pouch that is kept in those drawers? And how did you handle learning their names? I Am wanting to switch to more flexible seating this year and lose two tables. Those are the two things I still need to figure out. Bed risers are a great idea. Thanks for sharing. Every child does not have their own specific pencil pouch. There are just a bunch of community ones to grab and go. I have name cards in a slit in their mail cubby. They can grab it anytime they need it. Names are also posted all over the room for different reasons. It really has never been a big issue. Love this post! Thanks for taking so much time to write in from your teacher heart. You have inspired me to continue to find ways for my littles to have options. What do you call the foot board that goes under the desk or table? Thanks so much for your kind works. Those balance boards are actually linked. If you click on the picture you can get their full description and such. I overlooked the link. Thank you! I have just finished my second year of reorganizing my space also. 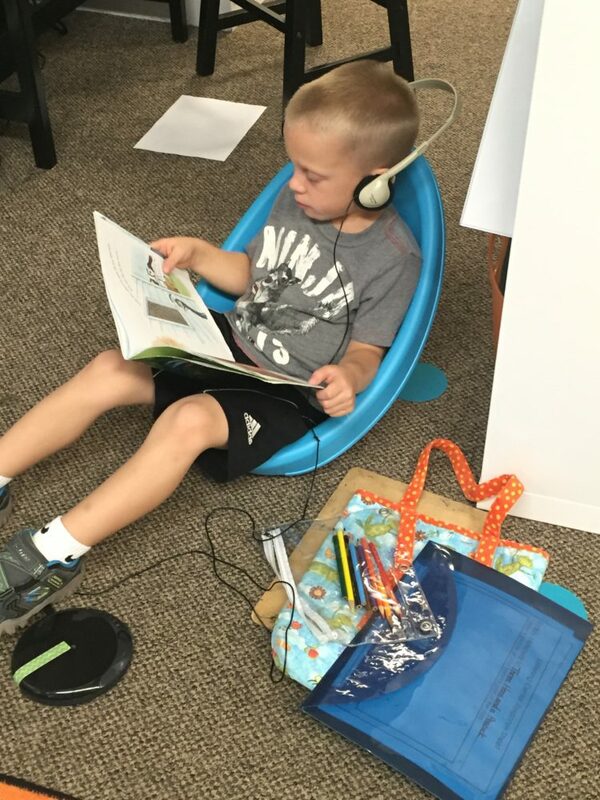 I did have one isolated standing desk this year with bounce bands on the legs in addition to my standing table. It looks like your tables are similar to what I have. 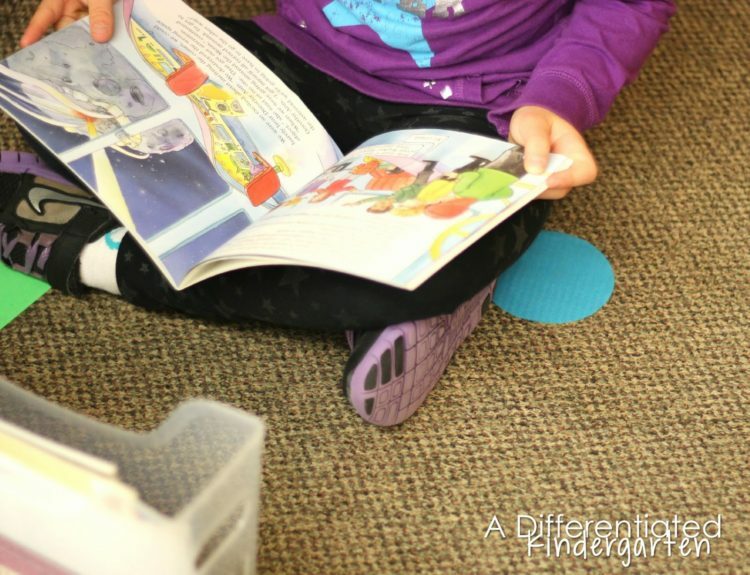 We were able to actually raise the legs to an appropriate height for standing kindergartners as well as lowering one to the ground with cushions for seats. These has been very popular work spots! Enough space seems to ALWAYS be an issue! My tables do adjust but I’m hoping for something a bit smaller and easier to adjust on the fly. Those big tables are a beast! But I may just have to bite the bullet and use them. This post had SO many good ideas. I just finished my 2 year teaching Kinder and I don’t have much stuff. Do you have ideas on gettings these things for cheaper? I noticed the prices on those amazon links and it’d be years down the road before I even have half of what you’ve gotten. But I love the ideas and I’ll be looking for creative seating options so that my kids can move around. Thanks for this post. It was very inspiring! I’ll have to go garage saling some time soon! Look into classroom light filters. They are fabric light covers that go over your lights and filter it. I have them on all my lights and they are amazing. Very calming and they really do take the glare away. 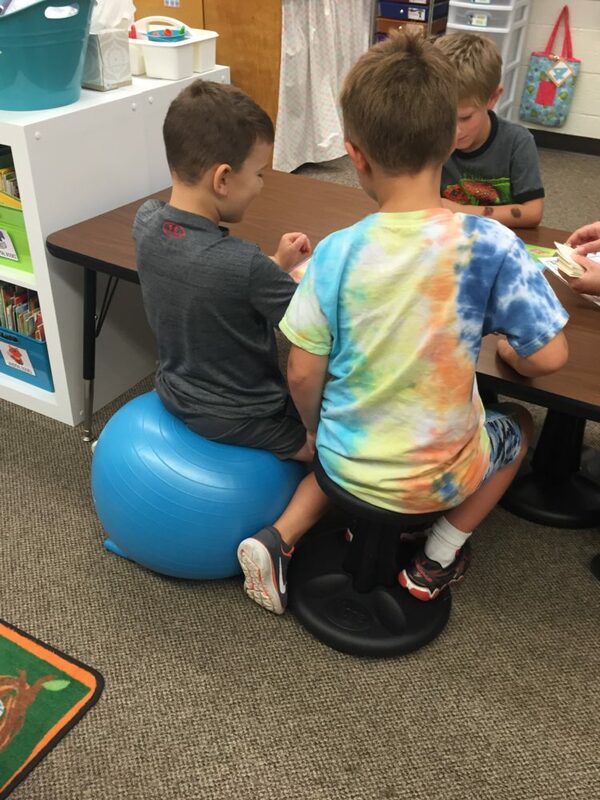 Do you use the 12 inch or 14 inch wobble seats for your kindergartners? I wish my kids could be in your class. You are amazing, an outside the box thinker! Standing at the white board, working at easels or just taping paper to a wall or side of book shelf are also possibilities. Plus, it’s great for arm and trunk strength and wrist extension which are precursors to good writing.